Park House Healthcare is a market leading supplier of specialist pressure care equipment to the NHS, Acute Community and Nursing Home sectors. The company identified Radio Frequency Identification (RFID) as the best option to improve the management and traceability of their specialist equipment. The chosen technology needed to withstand the harsh conditions of regular decontamination. Not familiar with the complicated field of RFID, Park House Healthcare turned to CoreRFID. Each specialist pressure care mattress system supplied by Park House, consists of three parts: a mattress, a mattress cover and a pump. All three elements must be delivered to each site in order for the mattress system to be used. All three parts must also be collected and decontaminated when no longer required. Keeping track of all the individual items was previously done manually, meaning it was a time consuming task prone to errors. Park House Healthcare opted to develop their own system to automate the process but when looking for RFID technology, they decided to leave it to the RFID experts. After full evaluation and thorough testing, CoreRFID chose and supplied handheld AtiD RFID readers, along with Cane RFID fixed readers. Datamars UHF RFID tags proved to be the most suitable for the harsh deep cleansing environment. 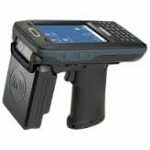 The handheld RFID readers are used in the delivery vans and at the end destination to record when and where the items of equipment have been delivered to. The fixed point RFID readers have been installed in portals at the decontamination suite so all equipment is automatically registered upon return.